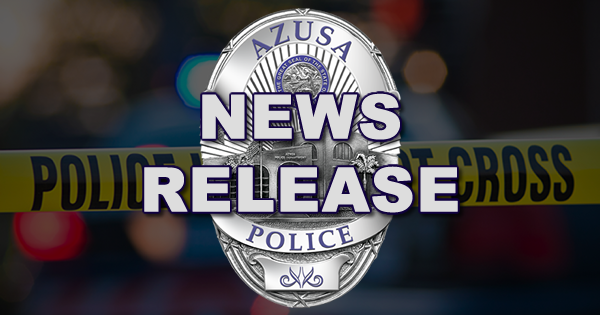 On September 19, 2018 at 8:25 pm, Azusa Police Officers were sent to an apartment complex in the 500 Block of E. Arrow Hwy., Azusa, regarding an assault with a deadly weapon investigation. Arriving officers found two female adult victims who had sustained non-life threatening stab wounds. Both victims were treated at the scene by Los Angeles County Fire Department personnel and were then transported to a local hospital for additional medical treatment. During the subsequent criminal investigation, Azusa Police investigators were able to determine this assault was domestic violence in nature and identified the outstanding suspect as Frank Perez, 27 years, a Covina resident. Perez was later found at a park in the City of Covina and was arrested for various charges including domestic violence, assault with a deadly weapon, and attempted murder. If you have any information regarding this case or subjects involved in this case, please call the Azusa Police Department at (626) 812-3200. If you wish to remain anonymous, you may do so by clicking here. Sexual Assault Suspect Arrested by Azusa P.D.